When Do You Want to Play Battlefield V? Check out all the options you have for playing early and getting incredible extras. There are lots of options to play Battlefield™ V before it officially launches on November 20; you can pre-order the game or become an EA Access or Origin Access subscriber. If you want to know how to play early, this quick guide will help get you on the front lines as soon as November 9. Want to skip the trials and barriers and get right to all-out war as soon as possible? One of the best ways to play Battlefield V early is with Origin Access Premier for PC**. Not only will you get to play the full game first, but you’ll also score all the Deluxe Edition extras like five Sets of Paratrooper Outfits and the chance to take on Special Assignments and Starter Assignments, 20 weekly Airlifts, the Firestorm Ranger Set, one additional Special Soldier Set, and immediate access to five Battlefield 1 Weapons*. Visit Origin.com to join and learn all about subscriber benefits, available games, and more. 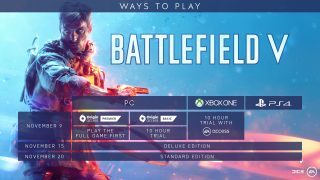 Want to try Battlefield V for ten full hours starting on November 9? Origin Access Basic** will give you the chance. You’ll be able to access all multiplayer modes and maps available at launch plus the Prologue and Under No Flag single-player War Story. And if you decide to buy the game, you'll save 10% and your progress carries over. Get the details about subscription by clicking here. Don’t need to be the first boots on the ground but still want to get in early? Pre-order the Battlefield V Deluxe edition on Origin.com and on November 15 you’ll gear up and join the fight. 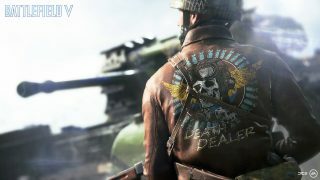 The Battlefield V Deluxe edition* gets you on the front lines days before launch. There’s still time to pre-order for early access and all the extras. Xbox One players can visit the store here. Be among the first to enter mankind’s greatest struggle when you pre-order the Deluxe Edition. There’s still time to secure early access and all the extras. Pre-order it here. Want more details on all the extras you can get when with the Battlefield V Deluxe Edition or Standard Edition, including two more Sets of Paratrooper Outfits? You can read more about them here. There’s no wrong choice when it comes to when you want to enter mankind’s greatest conflict. But the pre-order window is closing fast, and if you’d like to play the full game first, your best option is to join Origin Access Premier on or before November 9, 2018. Good luck and see you on the battlefield. **CONDITIONS, LIMITATIONS AND EXCLUSIONS APPLY. SEE ea.com/ea-access/terms AND origin.com/store/origin-access/terms FOR DETAILS. One free trial per EA account. After the trial, the current Origin Access monthly or annual subscription fee will be billed. Cancel during the trial period without charge.